Maxi Stacker Series:Our steel banquet chairs are designed for high-traffic venues requiring a solid, reliable, super efficient seating solution..
Nufurn steel banquet chairs : the next generation of stackable banquet chairs customized to your specification. All Nufurn banquet chairs are manufactured to specification. We offer a large range of Nufurn powdercoat colors and fabric finishes. Alternatively, we can customize your steel banquet chairs in your own fabrics and powdercoat colors as well as design a banquet chair specifically for you. 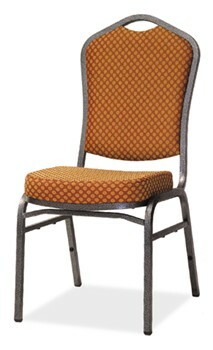 Nufurn steel banquet chairs are manufactured with either a fully welded steel or next generation alumnium frame. All Nufurn banquet chairs come with our exclusive 12-year commercial warranty. Contact us today to see how we can enhance your function center with our steel banquet chairs.